After the longest activation in its more than 50-year history, the Hurricane Watch Net (HWN) secured operations for Hurricane Matthew on October 9 at 0400 UTC. HWN Manager Bobby Graves, KB5HAV, reported that the net was in continuous operation for 6 days, 7 hours, gathering real-time ground-truth weather data as the storm passed through the Caribbean and up along the US Eastern Seaboard, and passing the data along to WX4NHC at the National Hurricane Center (NHC). Various Amateur Radio Emergency Service (ARES) nets also activated along the East Coast. The first major hurricane of the 2016 Atlantic hurricane season and, at one point, a Category 5 storm, Matthew was downgraded to a post-tropical cyclone as it headed out into the Atlantic. "Many have perished in Haiti and Cuba as a result of Matthew, and the death-toll rises still," Graves noted. "Many residents in the Bahamas and the US East Coast states of Florida, Georgia, South Carolina, and North Carolina felt the impact of Matthew as well." More than 30 died in the US. FEMA reports that power remained out for thousands of Florida, Georgia, South Carolina, and North Carolina residents as of October 13. Cell service also was affected. The VoIP SKYWARN/Hurricane Net (VoIPWX) attracted a number of visitors, according to net managers. "On board Saturday afternoon, in addition to WX4NHC at the National Hurricane Center, stations representing a number of FEMA regional offices and the National Response Coordination Center monitored the net for actionable intelligence to be used to plan recovery operations," said net Public Affairs Officer Lloyd Colston, KC5FM. The net also activated on October 3. The net said its Georgia Reflector was linked to the WX-Talk conference, so net managers could help to relay reports to local National Weather Service offices on NWSchat and the NHC. According to Chief of Operations Dennis Dura, K2DCD, the net established a link up the East Coast into North Carolina and continued to monitor for damage assessment in areas the hurricane had already passed. The net supported the NHC on the WX-Talk Conference, Node #7203 on EchoLink. The Salvation Army Team Emergency Network (SATERN) on 14.265 MHz also was active for Matthew, handling outbound emergency, priority, or health-and-welfare traffic from hurricane-affected areas. Among activities in Georgia, ARES District Emergency Coordinator and MARS member Tom Holcomb, K5AES, reported that WX4GMA, the Georgia Emergency Management Agency ARES team station, was activated on October 7, running 12-hour shifts. Operation was on HF as well as on D-STAR and EchoLink. HF message traffic included shelter updates from coastal counties and periodic NHC weather updates via WX4NHC, which were passed along to the GEMA director. Coastal county-related traffic and weather updates also were handled via D-STAR. WinLink was used to pass periodic status updates from the Georgia State Defense Force, a volunteer component of the Georgia Department of Defense. The EchoLink Georgia Conference node provided updates on storm-related conditions. On October 6, ARES and Army MARS personnel were called on to provide technical assistance to, and an operator for, a FEMA SHARES station in Atlanta. Among activities in South Carolina, ARES volunteers staffed evacuation shelters, with radio amateurs coming from outside the affected areas to help. "Overall, I believe the radio operators that were available for the event did an outstanding job and I am proud to know them," said South Carolina Section Emergency Coordinator Joe Markey, AJ4QM. According to FEMA on October 13, mainstream river flooding threatened the Carolinas, and some dams were breached. Several hospitals remained closed. The Hurricane Watch Net activated again for several hours on October 13 for Hurricane Nicole, after a hurricane warning went into effect for Bermuda. The NHC at one point called Hurricane Nicole an "extremely dangerous" Category 4 storm, with maximum sustained winds of 125 MPH. The VoIP Hurricane Net (VoIPWX) also activated to monitor online weather stations and storm bloggers from the Caribbean Hurricane Network (stormCARIB), as well as social media. "While we do hope this is the last hurricane for this season, let us not forget we are still in Hurricane Season," the HWN's Graves said. The Atlantic Hurricane Season ends on November 1. In comments filed on October 12 with the FCC, ARRL reiterated its case that the FCC should impose a 2.8 kHz limit on symbol rate for digital modes, arguing that its approach is both balanced and necessary. ARRL had asked the FCC to change the Part 97 rules to delete the symbol rate limits in Section 97.307(f) and replace them with a maximum bandwidth for data emissions of 2.8 kHz on amateur frequencies below 29.7 MHz. In a July Notice of Proposed Rule Making (NPRM) in WT Docket 16-239, the FCC proposed to eliminate the current baud rate limitations for data emissions, consistent with ARRL's Petition, but it declined to propose a bandwidth limitation for data emissions in the MF and HF bands to replace the baud rate limitations. ARRL told the FCC in its comments that the current HF symbol rate "speed limit" reflects 1980s technology and has no place in an experimental radio service in which modern protocols could be efficiently deployed in crowded RTTY/data subbands. 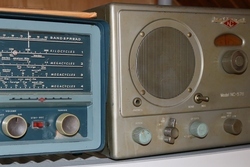 "The symbol rate limit was created in order to maximize the efficient use and reuse of that crowded, shared spectrum, but the assumptions made at the time are no longer valid," ARRL said, "and the rules now prohibit radio amateurs from utilizing state-of-the-art technology, thus precluding or substantially inhibiting any meaningful contribution to the advancement of the radio art in this area." ARRL said earlier assumptions are no longer valid mainly because there is no correlation between the data rate and the occupied bandwidth in the rules now. The League said present rules in the HF data subbands promote inefficiency, allowing data transmissions of unlimited bandwidth as long as the symbol rate is sufficiently low, and it stressed that there must be some limit on occupied bandwidth for HF data emissions. "Eliminating the symbol rate limitations for data emissions and substituting a maximum authorized bandwidth would permit the utilization of all HF data transmission protocols presently legal in the Amateur Radio Service, as well as state-of-the-art protocols that fall within the authorized bandwidth," the League said. The deadline to file reply comments in the proceeding -- i.e. comments on comments already filed -- is November 10. Read more. "Bits vs Baud" is the topic of the latest (October 6) episode of the "ARRL The Doctor is In" podcast. Listen...and learn! Of the 489 ARRL National Parks on the Air (NPOTA) units, the real stars of the event have been the National Scenic and National Historic Trails. Added to the National Park Service official units list in the last week of 2015, the trail units have accounted for the majority of NPOTA activations this year. Nine of the top 10 most-activated NPOTA units are trails, with nearly 11 percent of all NPOTA contacts (80,580 QSOs) made from an eligible National Scenic or Historic Trail. The Lewis and Clark National Historic Trail (TR-09) leads the pack, with nearly 13,000 contacts made from numerous points along the trail. All told, 121,650 contacts have been made from the 23 trail units in NPOTA, amounting to slightly less than 17 percent of the 720,000 total contacts. The rarest trail unit is the Ala Kahakai National Historic Trail (TR18) in Hawaii. Only 592 contacts have been made from there. Thirty-three activations are on the NPOTA calendar for the week of October 13-20, including the Pictured Rocks National Lakeshore in Michigan, and Adams National Historic Park in Massachusetts. The Pacific Seafarer's Net relayed a call for help and contacted the US Coast Guard on September 28, after the SV Rafiki began taking on water some 230 miles south of Cold Bay, Alaska. At approximately 0300 UTC, Charles Houlihan, KD6SPJ, a net relay station, received the distress call from the sailboat's caption. Houlihan, who was also at sea in SV Jacaranda, contacted Randy VanLeeuwen, KH6RC, a net relay station in Hawaii. He, in turn, got in touch with Hawaii USCG District 14 to report the incident and provide Rafiki's location. 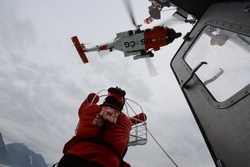 The Hawaii USCG district then contacted the 17th USCG District in Alaska, which handled the rescue. VanLeeuwen kept in constant radio contact with the Rafiki until contact was lost. Fred Moore, W3ZU, in Florida, and Peter Mott, ZL1PWM, in New Zealand, also were on frequency and in contact with the vessel's captain until a US Coast Guard rescue helicopter arrived. The Jayhawk helicopter crew was able to hoist the captain and a crew member to safety at around 1000 UTC, after dropping survival suits. Both men were reported to be uninjured, but the vessel was abandoned. The two men were taken to Kodiak, Alaska, for medical attention. Downsizing your shack? Want your now-unused equipment to help promote and preserve Amateur Radio for future generations? Consider donating your used Amateur Radio and test equipment to ARRL. 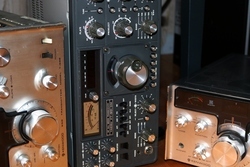 The ARRL Lab accepts used equipment from radio amateurs and their families. Once evaluated, much of the donated equipment is sold, and proceeds help to fund programs that educate, promote, and preserve the values of Amateur Radio. Assistant ARRL Laboratory Manager Bob Allison, WB1GCM, is spearheading the donation program. "A common problem for hams and their families is what to do with surplus Amateur Radio equipment," Allison said. "We have, for a number of years, accepted in-kind donations on a limited basis. Now, thanks to dedicated volunteers in the ARRL Lab, we have additional help to efficiently clean and test donated equipment. So, we're letting our members know that the donation door is open; all are welcome!" Allison said that many donors have expressed satisfaction and, at times, relief that their equipment is going to a good cause. "An alarming amount of relatively new equipment has ended up in dumpsters, because family members had no idea what the equipment was or what to do with it. That is a shame," he said. For more information on how to donate used amateur equipment, accessories, and test equipment, contact the ARRL Laboratory via e-mail at labdonations@arrl.org or by telephone at (860) 594-0214 during ARRL Headquarters business hours. ARRL is an IRS-designated 501(c)(3) organization holding federal tax identification number 06-6000004. While ARRL gladly acknowledges receipt of all in-kind donations, the League cannot, by law, provide donors with a dollar value for items donated. 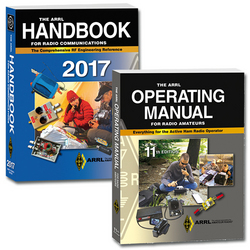 The 2017 edition of The ARRL Handbook and 11th edition of The ARRL Operating Manual are now shipping. As a special introductory offer, you can get the hardcover handbook at the softcover price. The ARRL Handbook for Radio Communications is the standard for applied theory and practical information concerning the fundamentals of radio electronics and wire communications. It's filled with the most up-to-date knowledge representative of the wide and ever-expanding range of interests among radio amateurs. There are hands-on projects for all skill levels, from simple accessories and small power supplies, to legal-limit amplifiers and high-gain antennas. The ARRL Operating Manual for Radio Amateurs is the most comprehensive guide to Amateur Radio operating -- everything you need to get involved, get active, and get on the air. Each topic has been written and updated by experienced hams. They are happy to share what they have learned so that you can get involved too. The ARRL Handbook is available in hardcover and softcover editions from the ARRL Store or your ARRL Dealer. Hardcover: ARRL Item No. 0635, ISBN 978-1-62595-063-5, $59.95 retail, special offer $49.95 while supplies last. Softcover: ARRL Item No. 0628, ISBN 978-1-62595-062-8, $49.95 retail. The ARRL Operating Manual is available in softcover from the ARRL Store or your ARRL Dealer. Softcover: ARRL Item No. 0598, ISBN 978-1-62595-059-8, $24.95 retail. It is also available as a two-part e-book (Volumes 1 & 2 and Volumes 3 & 4) for the Amazon Kindle. To order call (860) 594-0355 or, toll-free in the US, (888) 277-5289. Contact ARRL Publication Sales for more information. With the fall semester well under way, school clubs are at full throttle. That means it's time for the ARRL School Club Roundup (SCR) -- fall edition. Propagation typically improves at this time of year, and clubs should not find it too difficult to make contacts across the US and around the globe, even with a modest station. Unlike most contests, this one takes place during the week. SCR 2016 starts on Monday, October 17, beginning at 1300 UTC, and runs through Friday, October 21, at 2359 UTC. Stations may operate for up to 24 hours during the entire contest, and may only operate for 6 hours during any single 24-hour period. A trio of operators at the Dresden Elementary Amateur Radio Station club's KD8NOM took turns calling, logging, and searching for multipliers in the Spring 2016 running of the School Club Roundup. There are five participation categories: Elementary/Primary, Middle/Intermediate/Junior High School, Senior High School, College/University Club, and Non-School Club. There is also an Individual category. If you just want to get on the air and hand out contacts, enter in the Individual category. Any mode -- SSB, CW, or digital -- is okay. Tune around and listen for SCR stations calling CQ, or do it yourself and see who answers (call "CQ School Clubs" if you aren't a club station). Stations exchange signal report, category (School, Club, or Individual), and state, province, or DXCC entity. Once the contest is over, submit your log online (preferred) or on paper. The most popular time for younger students to be on the air is during after-school hours, but the older students may be on the air at any time. All groups are limited to one transmitter on the air. The School Club Roundup is co-sponsored by ARRL and the Long Island Mobile Amateur Radio Club (LIMARC), and results appear in QST as well as online. Logs are due by November 8. Read more. 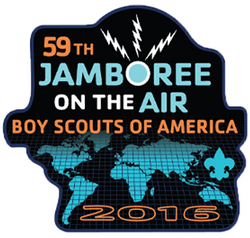 With Scouting's Jamboree On The Air (JOTA) just days away, JOTA Coordinator Jim Wilson, K5ND, said this week that approximately 340 US Amateur Radio stations have registered for this weekend's event. That's out of a total JOTA and JOTI (Jamboree on the Internet) count of 596. The official JOTA-JOTI sign-up system remains open. JOTA will be on the air October 14-16. Wilson urged all stations that register to file post-JOTA reports. Wilson was not optimistic about favorable HF propagation this weekend, but he is hoping for the best. Most JOTA activity will center around selected HF frequencies. More than 1 million Scouts in 150+ countries -- at nearly 18,000 stations -- are expected to take part in JOTA 2016, engaging with other Scouts to talk about Amateur Radio and their Scouting experiences. Nominations are open for the 2016 ARRL International Humanitarian Award. This award is conferred upon an individual radio amateur or Amateur Radio group that has demonstrated devotion to human welfare, peace, and international understanding through Amateur Radio. The League established this annual award to recognize Amateur Radio operators who have used ham radio to provide extraordinary service to others in times of crisis or disaster. A committee appointed by the League's president recommends the award recipient(s) to the ARRL Board of Directors, which makes the final decision. The committee is now accepting nominations from Amateur Radio, governmental, or other organizations that have benefited from extraordinary service rendered by an Amateur Radio operator or group. Amateur Radio is one of the few telecommunication services that allow people throughout the world from all walks of life to meet and talk with each other, spreading goodwill across political boundaries. The ARRL International Humanitarian Award recognizes Amateur Radio's unique role in international communication and the assistance amateurs regularly provide to people in need. Nominations should include a summary of the nominee's actions that qualify the individual (or individuals) for this award, plus verifying statements from at least two people having first-hand knowledge of the events warranting the nomination. These statements may be from an official of a group (for example, the American Red Cross, The Salvation Army, or a local or state emergency management official) that benefited from the nominee's particular Amateur Radio contribution. Nominations should include the names and addresses of all references. All nominations and supporting materials for the 2016 ARRL International Humanitarian Award must be submitted in writing in English to ARRL International Humanitarian Award, 225 Main St., Newington, CT 06111 USA by December 31, 2016. In the event that no nominations are received, the committee itself may determine a recipient or decide to make no award. The Administrative Council of the International Amateur Radio Union (IARU) held its annual in-person meeting on October 7 and 8 in Viña del Mar, Chile, prior to the IARU Region 2 (IARU R2) Conference. The Council is responsible for the policy and management of the IARU and consists of the three IARU international officers and two representatives from each of the three IARU regional organizations. The Council assigned priorities to the agenda items for the 2019 World Radiocommunication Conference (WRC-19) of the International Telecommunication Union (ITU) and affirmed the adoption of a matrix approach to Conference preparation, as agreed earlier in the year. The matrix approach is designed to ensure effective coordination among the numerous IARU volunteers who participate in and monitor preparatory meetings of the ITU and regional telecommunication organizations. Along with several items of potential concern to radio amateurs, the agenda includes a possible allocation in Region 1 of 50-54 MHz to the Amateur Service to harmonize with the allocations in the other two regions. The permanent working document setting out the long-term spectrum requirements of the Amateur and Amateur-Satellite services was reviewed and updated to reflect the outcomes of WRC-15. A strategic plan to develop support for amateur spectrum allocations between now and 2020 was adopted. The Council received reports from coordinators and advisers, including Peter Jennings, AB6WM/VE3SUN, International Beacon Project Coordinator; Hans Blondeel Timmerman, PB2T, Satellite Advisor; Hans Zimmermann, HB9AQS, International Coordinator for Emergency Communications, and Thilo Kootz, DL9KCE, EMC Coordinator. The four volunteers were reappointed for 3-year terms. Read more. Round-the-world cyclist Thomas Andersen, OZ1AA/K9DXX, is back home in Denmark after a little more than 6 1/2 years of on-and-off cycling. On October 8, Andersen arrived at the spot where his Odyssey began -- the central square of Copenhagen. Begun in 2010, Andersen's "Cycling the Globe" adventure covered some 36,000 miles. 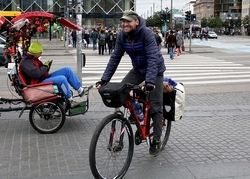 A smiling Thomas Andersen, OZ1AA, rides victoriously into Copenhagen, Denmark, wrapping up his "Cycling the Globe" adventure. "Best wishes from Copenhagen where I'm resting my legs now," the 33-year-old telecommunications engineer said. "It was very special for me to cycle into the City Hall Square in Copenhagen -- the exact same place where I left by bike in October 2010. I was thinking about all the fascinating places I have seen and all the amazing people I have met in those 6 years -- the best 6 years of my life." Andersen said that after his arrival, he went to the local radio club and, using special event call sign OZ1BIKE, made some 200 contacts with stations all over Europe and America, including some he had visited on his trip. "I...imagined their shacks and antennas as they called in," he said. "So many great memories." 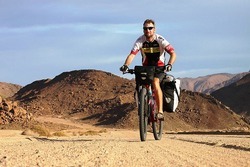 Thomas Andersen, OZ1AA, on his way across Namibia. Andersen said his bicycle adventure stemmed in part from a desire to attempt something that he was not entirely sure he could finish. But, he said, it was an opportunity to combine his favorite activities -- cycling and ham radio. "For me, the chance to meet new people, to make new friends, and to see and learn about their way of life is the true highlight of the trip," Andersen told ARRL in 2015. "Ham radio certainly plays a big role in making that possible." "Now it already feels strange not to be cycling anymore," Andersen said this week, "but the weather has turned cold and rainy here in Copenhagen, so I enjoy being indoors for now." 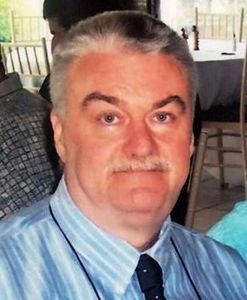 Former ARRL DXCC and Awards Manager Bill Moore, NC1L (ex-KA1MRR, KB1UN), of Newington, Connecticut, died on October 6. He was 64. Moore was seriously injured in a motor vehicle accident in July 2014 that left him paralyzed from the chest down. He was never able to return to work at ARRL Headquarters and retired in 2015. An ARRL member, Moore had worked at League Headquarters for 23 years, starting in 1992. 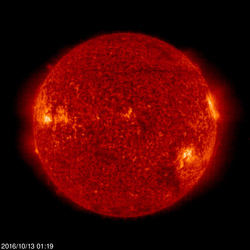 Tad Cook, K7RA, Seattle, reports: At 0356 UTC on October 13, the Australian Space Forecast Centre issued a geomagnetic warning calling for increased solar wind speed due to coronal hole effects expected for October 14 and 15, and active conditions, with possible minor storm periods. Solar flux and sunspot numbers rose over the past week, while geomagnetic indicators were down. Average daily sunspot numbers for October 6-12 rose 34.3 points to 55, and the average daily solar flux rose 15.2 points to 101.9, referenced to the previous 7 days. The average planetary A index declined from 21.4 to 6.6, and the mid-latitude A index dipped from 15.1 to 5. Predicted solar flux is 95 on October 13-14; 90 on October 15-21; 85 on October 22-26; 80 on October 27-29; 90 and 95 on October 30-31; 100 on November 1-2; 105 on November 3-7; 110 on November 8-9; 105 and 100 on November 10-11; 95 on November 12-14; 90 on November 15-17, and 85 on November 18-22. Predicted planetary A index is 18, 30, 15, 12, and 15 on October 13-17; 10 on October 18-19; 5 on October 20-22; 20 on October 23; 35 on October 24-26; 20 on October 27; 15 on October 28-30; 25 on October 31; 12 on November 1; 5 on November 2-6; 8 on November 7-8; 5, 12, and 15 on November 9-11; 12, 20, and 8 on November 12-14; 5 on November 15-18; 20 on November 19, and 30 on November 20-22. Sunspot numbers for October 6 through 12 were 55, 50, 62, 58, 64, 56, and 40, with a mean of 55. The 10.7 centimeter flux was 101.5, 104.2, 104.3, 104.5, 102, 99.2, and 97.6, with a mean of 101.9. Estimated planetary A indices were 6, 6, 8, 5, 11, 4, and 6, with a mean of 6.6. Estimated mid-latitude A indices were 4, 5, 7, 4, 7, 3, and 5, with a mean of 5.